Recently I've been hearing a lot of things like "I don't get why people go out to eat alone" or "that's so weird, I could never do that." I love spending time with my friends, family, and boyfriend but I also enjoy being alone. People are so quick to shoot down the idea of going out in public by themselves, so I wanted to share ten reasons why having you time is important. 1. You don't need to rely on anyone else. 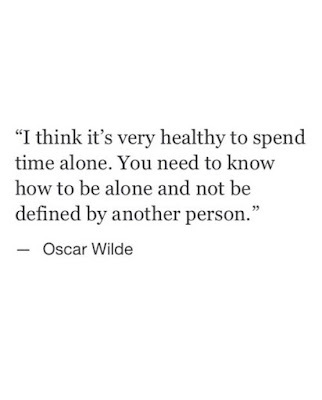 When you become content with spending time alone you won't feel like you always have to be around other people. This is something that took me awhile to realize, but when I finally did realize it it was sort of like a weight was lifted off my shoulders. I use to be the person who felt like I always had to be out and about with friends which can get exhausting. 2. Having nowhere to be is a gift in its own. If you're someone like me who works all the time and finally gets a day off, all I really want to do is relax at home and enjoy it. A place where I don't feel like I have to look nice or do my makeup is always a plus. I've grown to absolutely love relaxing days at home, plus it's a good opportunity to give your body a break. 3. You can get caught up in a good book or t.v series. I love spending time by myself so I can get lost in a good book. Or even starting a new series on Netflix, which can sometimes be dangerous if you're an avid binge watcher like me. 4. You need your own space. When you allow yourself to have alone time you're allowing yourself to enjoy the time you're giving yourself. You won't have to feel like you need validation from other people because you're content with yourself. I really like this quote regarding needing your own space, "I withdraw from people and places from time to time, I need space from a world that is filled with millions of mouths that talk too much but never have anything to say." 5. You'll keep your sanity. For me, when I'm in a mood I just want to be alone to get my mind right and calm down. Taking a walk or sitting down to grab coffee by yourself is seriously the best therapy you can give yourself. 6. Bottle of wine for one, please. Going out with the girls is fun and I'm all for it every now and than, but I'd much rather prefer buying myself a bottle of wine and staying in. Some people fail to realize this, but it doesn't make you lame. You're saving money and you can relax in the comfort of your own home while doing so. Plus I mean, I have an entire bottle of wine to myself so..
7. You don't feel rushed. I love running errands by myself because I don't feel like I have to rush around for anyone. I can take my time and walk around the entire store five times if I wanted too without having someone ask if we can leave or if I'm almost done. 8. You discover your true self. Sometimes hanging out with people 24/7 can turn you into a person you're not. You start to feel like you have to meet certain standards or act a type of way or these people won't like you anymore. You can often lose yourself if you don't take time for yourself and you need to love who you are. 9. You'll learn how to be independent. This is so important because you can't go through life feeling like you have to rely on other people. At the end of the day there is only one relationship you will be in forever, and that's the relationship with yourself. 10. You'll become a healthier version of yourself. It's proven that spending alone time is good for the soul, so take advantage of it! Go enjoy a coffee date by yourself and get some work done or the next time you have errands to run, don't invite anyone. 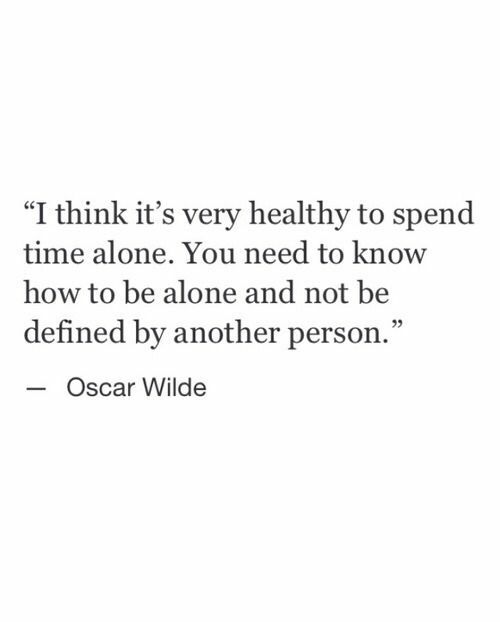 Enjoy the time you're able to spend alone and love yourself.